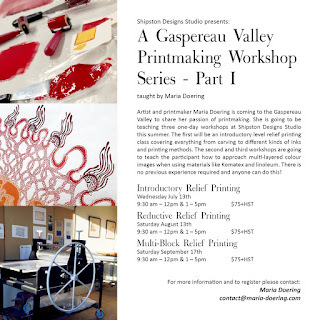 On August 13th, I returned to the Gaspereau Valley and Shipston Designs Studios for the second workshop in our workshop series. This all day session focussed on the reductive method of relief printmaking, which means that you print multiple colour layers from a single block. I had prepared the blocks of Marmoleum for this workshop two nights before the workshop and promptly forgot to bring it. Julie was very accommodating and offered I cut a piece from her Marmoleum flooring in the studio. It worked great! Julie captured the awesome shot of my hands glowing in the sun, while I was trimming the Marmoleum down to the correct block size. Let the fun begin, little introduction session. The recent print I did using Akua inks, I held on to one print from each colour layer to show the gradual change of the image, as well as show what the original colour was before it was printed overtop the others. Perry working hard on carving his Seagull. Messy work table is a great sign of much productivity. Different colour choices and combinations of the Akua Inks that we are using. Louise inking up her block for the first time. Using Louise's block to demonstrate how printing on Julie's beautiful printing press works. Louise is ready to edition her yellow layer. Chelsea inking her first layer, which she carved out of Komatex. All first layers are done, now back to carving more from the same block. Chelsea touching up her final layer. Sian carving the second layer of her swan print. Louise's two different stages and her block. The image are two cats fighting. Perry - being a fun printmaker. Perry's print with the final layer printed. Perry's two color reductive seagull print. Stephane and Perry working hard. Chelsea's finished two colour reduction print using Komatex. First layer on it's own on the left, second layer on top of the first on the right. Sian signing her lovely finished prints. Chelsea, Perry, Stephane, Louise, Maria and Sian. The proud participants with their prints. Two amazing workshops down, one more to go on September 17th. If you are interested in participating, there are still seats left. Thank you kindly to Peter Rosvall and Julie Rosvall for being their usual kind souls and generous hosts! Many of the photos in this post were taken by Julie, she also did an amazing job posting about the progress of the workshop online, and spreading the word about it. Thank you Julie! très bien! fun day all around ! In case you're still going back and forth about online publication printing, perused on to know the benefits of online blurb printing.